Save The Avengers. If that counts. IM3 actually shares a lot with The Avengers, the same playful tone as well as several crowd pleasing and inventive action sequences. The last time we saw Tony Stark (Robert Downey Jr.), he was eating shwarma with the rest of the Avengers after saving New York City, and ostensibly the world, from an alien god and his invading army. Stark is now suffering from some serious PTSD since nearly sacrificing his life flying into space with a live nuclear missile not to mention the fact that his last solo effort was rightfully panned. Much like Chris Columbus’ work on Harry Potter, Jon Favreau deserves a lot of credit for laying the groundwork for the Marvel cinematic universe (MCU), but neither the first nor the the second Iron Man are that great. Definitely not the second. The third film manages to surpass them because Shane Black is a writer-director with a distinct voice as well as a strong sense of action and character. That’s not to say IM3 doesn’t suffer from a lot of the same shoehorning-it-into-the-universe problems that pretty much all the Marvel films have had, whether it hampers the story or the aesthetic, but Black’s signature still manages to shine through. Set at Christmas, (with one set piece surely a callback to Lethal Weapon), Tony is trying to get over the events of New York and live a more normal life with Pepper Potts (Gwyneth Paltrow), however, the usually self-assured genius can’t sleep. And it couldn’t come at a worse time since the military, led his buddy Colonel Rhodes (Don Cheadle), has their hands full with a new terrorist threat named the Mandarin (Ben Kingsley). At the same time, Aldrich Killian (Guy Pearce), a rival scientist and character drawn right from Batman Forever, has teamed up with the brilliant Dr. Maya Hansen (Rebecca Hall) to develop Extremis, a secret project with great healing potential. As well as a few side effects, just ask James Badge Dale, who’s great in a small but fun part as Savin. All of the cast members bring their A game. RDJ and Black’s dialogue are a match made in movie heaven (if you haven’t seen Kiss Kiss Bang Bang, well, you’re in for a treat) and the writer-director’s style is a lot looser than Favreau’s, something that’s not only evident in his camera but in the direction of the actors. Pearce and Kingsley are endlessly enjoyable, as expected since the pair of two of the finest actors out there, but Paltrow is the real star of the show. Pepper has so much more to do in this film and the Academy Award winning actress shines in the extended part. Like it’s predecessors, IM3 is too long and suffers from more than a few breaks in story logic (one particular moment in the final showdown made absolutely no sense) but there are also a well- written few twists and turns that I thoroughly enjoyed and besides, the whole experience is so entertaining (and I’m not one to go too hard on comic book movies for stretching our belief a little too far) that all the minor quibbles are quickly forgotten as fast as the characters spout Black’s witticisms. 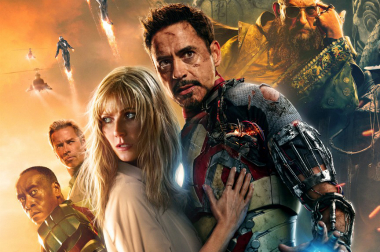 Iron Man 3 is a worthy followup to The Avengers (landing just behind it and Captain America in the MCU) and mocks the notion that the third in a series can’t be of the same quality. Sometimes it’s better. What a perfect way to start the summer blockbuster season and for Marvel to initiate Phase II. This entry was posted in Review and tagged IM3, Iron Man 3, marvel, Robert Downey Jr., Shane Black, The Avengers. Bookmark the permalink.